Upper 90 has established itself as the city’s premier soccer supplier with shops in Astoria, Cobble Hill and the Upper West Side. Their stores are stocked with the latest Nike and Adidas cleats and the current kits worn by various UEFA Champions League clubs. The Upper 90 shops are chic and carefully curated, with huge TVs and sleek, corporate designs. And they offer some cool features, like the hand-painted storefront at the Upper 90 on Atlantic Avenue in Cobble Hill, but they also embody the gentrification and sterilization of NYC neighborhoods, which I’ve written about here before. 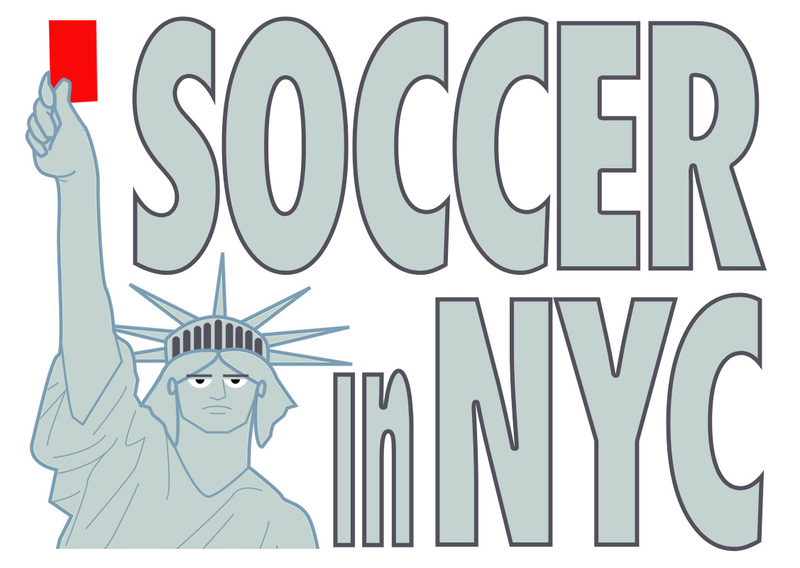 It’s hard to find a soccer shop with the haphazard character of an old community establishment in New York City, but there is at least one. Euromex is a second-floor storefront shop amid a row of Mexican stores and restaurants on East 116th in East Harlem. The stairway to the shop is lined with old Diadora posters and signed Mexico jerseys and the room is completely stuffed with Liga MX apparel and towers of cleat boxes. There are also several Honduran Liga Nacional snapbacks and jerseys from Salvadoran professional clubs, but teams from Mexico — especially Chivas — dominate. The shop has been around for at least 15 years, said Lola, one of the clerks. Lola has worked there for eight years, she told me as she used a long hook to fish around for old Spurs kits hanging on a hook near the tall ceiling. The store is completely filled with apparel — there doesn’t to be a back store room — and the staff keep track of items with handmade signs denoting each section. The best part of Euromex is the wall of old kits in a back corner, each one on sale for up to 35 percent off. There are generations of Real Madrid jerseys on the rack, easily distinguishable by their shirt sponsors (from Siemens to Fly Emirates) and their sleeve widths (from billowy to spandex). There were even a few Beckham shirts. The wall also features a dense collection of Barcelona strips, including the club’s two-toned centennial jersey with 1899 to 1999 written across the chest. Nearby, there are racks of random kits from the early 2000s, including Bolton Wanderers, Nottingham Forest, Stuttgart, Sunderland, West Ham and Newcastle hanging next to modern, neon Central American kits coated in sponsors. The older apparel is all on-sale, but I still found it relatively expensive. For example, I stopped myself from handing over $50 for a 2011 Spurs shirt. It seemed like the sort of store where you could negotiate a better price for a 2002 Bolton Wanderers jersey, though.